A man is discovered murdered in his flat and witnesses put a woman (Olivia de Haviland) at the scene of the crime, but other witnesses put her somewhere else. As a policeman (Thomas Mitchell) and a psychologist (Lew Ayres) investigate they discover the woman is an identical twin and have to work out which one is the murderer. 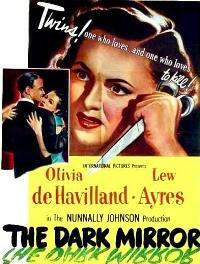 This is less of a mystery as you know who did it early in the film, but the intrigue of the film is the psychology between the two sisters (both played by Olivia de Haviland) and the psychological games the murderer plays with the psychologist, whilst her sister falls in love with him. This is well written and Vladimir Pozner was Oscar nominated for the story and Olivia de Haviland is good as the two identical sisters with different characters. The cinematograhy is also good where Olivia de Haviland appears as both characters in the same shot.